Li Baicheng is a charismatic fortune teller who services a clientele of prostitutes and shadowy figures whose jobs, like his, are commonplace but technically illegal in China. He practices his ancient craft in a village near Beijing while taking care of his deaf and dumb wife Pearl, who he rescued from her family's mistreatment. Winter brings a police crackdown on both fortune tellers and prostitutes, forcing Li and Pearl into temporary exile, during which they visit their hometowns and confront old family demons. Li's humble story is punctuated with chapter headings reminiscent of Qing Dynasty popular fiction. In Fortune Teller, Xu Tong continues his work documenting China's underclass, whose lives have gone largely unnoticed during the country's boom years. Xu spent a year filming nearly every detail of Li's daily existence and the ancient spiritual practices he administers. 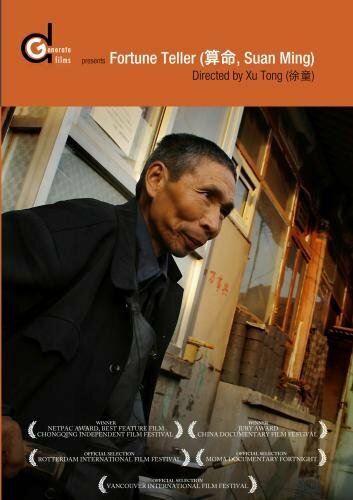 Fortune Teller is "an exhaustive case history on the marginalization of the poor and disabled under Chinese capitalism" (Ronnie Scheib, Variety), and a "complete immersion into their deceptively simple world in the countryside of northern China" (Ada Tseng, Asia Pacific Arts).